LAKE PLACID — For the second year in a row, this village hosted the Ironman 70.3 triathlon Sunday. While it brings in one last rush of tourists before the fall lull, some locals are indifferent to its inclusion in Lake Placid’s already stacked roster of summer events. Some roads are closed down, visitors fill Main Street and vacation rentals spike upward. The Enterprise recently held a poll on its website. The question — Is a second Ironman triathlon good for Lake Placid? By the time of this publication, 208 said yes, 169 said no and 31 were undecided. The Lake Placid Horse Shows, the full Ironman, the Can-Am Rugby tournament and the Lake Placid Summit Classic lacrosse tournament are scheduled in the middle of summer, but the 70.3 comes at the end right as local schools start classes. Village Mayor Craig Randall said he views the 70.3 as an end-of-the-summer economic boost. Randall said his office didn’t receive any significant backlash related to the 70.3 last year, which he thinks was in part due to the events committee’s strategic placing of the half-Ironman. Rainer Schnaars owns and operates the Bluesberry Bakery on Main Street right next to the Palace Theatre, and he said the 70.3 has pros and cons. One aspect of both triathlons Schnaar said he didn’t care for were the vendors set up at the Olympic Speedskating Oval. For the weekends of the races, the oval is converted into an athlete’s village of sorts often featuring food and retail kiosks. “They’ve got people selling shoes in there when we should just be promoting the Fallen Arch (a locally owned shoe store on Main Street),” he said. If the village wants to have more events all year-round instead of clustering them into the summer, Schnaars suggested building an indoor sports arena with a track, pool and other amenities for hosting weather-dependent sports. Financially, the Ironman races work like this. The village has a five-year contract for the full Ironman and a one-year contract for the 70.3. Both are handled by the Regional Office of Sustainable Tourism. Marketing fees start at $85,000 then go up $5,000 every year for the full Ironman. The village is in its second year, so the cost this past July was $90,000. The yearly contract for the Ironman 70.3 is $100,000. ROOST Communications Coordinator Carrie Gentile said in an email that those fees go toward Ironman USA maintaining websites and social media for the races. 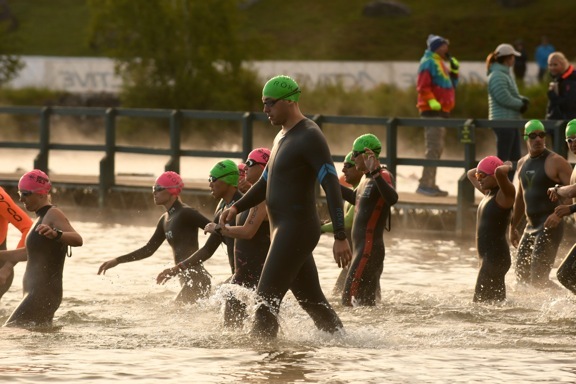 The Lake Placid Ironman used to be owned by entrepreneur Graham Fraser until he sold it to the Dalian Wanda Group Co., Ltd., a private Chinese conglomerate, which now owns 100 percent of the Ironman triathlons. Carlyn Miller has competed in past Ironman triathlons, and on Sunday she volunteered, directing competitors and pedestrians. She used to live full-time in Lake Placid, but she’s since moved to Albany and now rents out her property for long-term stays.